Mario Kart has gone from strength to strength over the years, and many of us have our own personal favourite entries in this superb series; as Mario Kart has evolved, so have rival Kart games from other developers. There have been some notable successes; Diddy Kong Racing and Crash Team Racing spring to mind, but head over to mobile platforms and there's a further avalanche of Mario Kart clones vying for your attention. One of these is Garfield Kart. 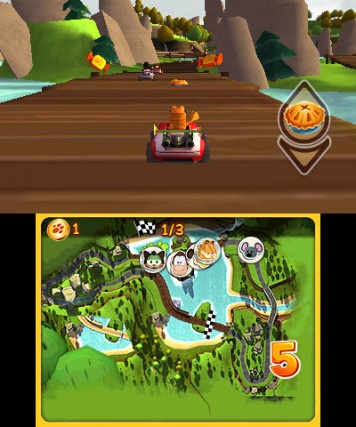 Having been available since 2013 on iOS, Android and PC/Mac, Garfield Kart has now arrived on Nintendo 3DS. Does Garfield have what it takes to park up next to Mario and friends at a meet-up, or should he just drive on by with his head down? That feeling continues with the single player. There are four cups to compete in, with only the first being unlocked initially. There's also a choice of 3 speed/difficulty settings, which are the standard 50cc, 100cc or 150cc. The opening Lasagne Cup consists of four courses set in fairly generic environments; a town, a desert, a scenic lake and a city. There's a quite nice Saturday morning cartoon feel to the graphics, but they don't really resemble the Garfield comic strip too much and subsequent cups don't get much more inventive, either. Before jumping into a race you make your choice of character, kart, hat, spoiler and boosts, all of which have an effect on either the overall handling or (in the case of boosts) affect the chances of receiving particular power-ups on track. On mobile platforms, real world money can be used to purchase additional objects and boosts instantly, but here everything must be earned either by winning races or picking up in-game coins. After making your choice of either Jon or Garfield (the only two characters available to start with) the race begins. Garfield Kart is essentially Mario Kart by numbers - there's nothing new here - a few different power-ups, but roughly speaking everything is as expected. 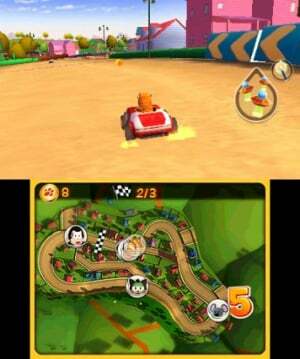 Race around the track, pick up candies for random power-ups and power-slide where possible to increase your speed. On its original platforms, Garfield Kart is pretty good. It has decent resolution, nice handling and is smooth and colourful. On 3DS however, the presentation has gone backwards. Indeed, even without a comparison to a 'better' version, it still wouldn't be very good. 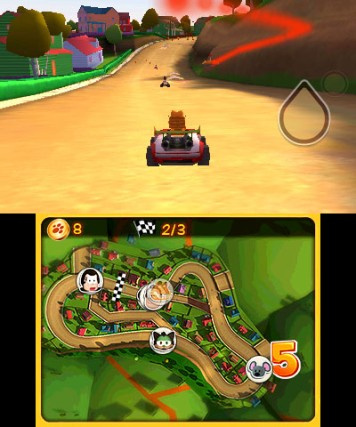 The Karts all look like they are floating on the track, mainly due to the absence of any shadows or interaction with the surface. On numerous occasions you'll find yourself stuck in the scenery or coming to a standstill for no apparent reason. None of this is assisted by the severely twitchy and badly judged Kart handling, all of which have way too much understeer. There's been a valiant attempt to emulate Mario Kart's technique of holding a power-slide long enough to gain a boost, but the majority of the time you'll be sliding out of control on all but the tamest of corners. When you eventually learn to be slightly proficient at controlling a slide it fast becomes clear that you don't even need it to be victorious; every single corner can be taken quite easily (even at 150cc) with no sliding required. The weapons are mostly imitations of Mario Kart classics; an Apple Pie (Green Shell), an Antenna Pie (Red Shell), Hot Lasagne (Boost Mushroom) – you get the idea. You can hold two items at once but you can't drag an item for a shield. Not that it matters as there's hardly any weapon interaction at all, the most recurring item being the 'Cuzzzhion' which sends everyone to sleep, a similar effect to using the Lightning Bolt in Mario Kart. The AI is horrendous (to put it bluntly). Begin playing on 150cc and it's quite simple to get into 1st position and stay there for the entire race. 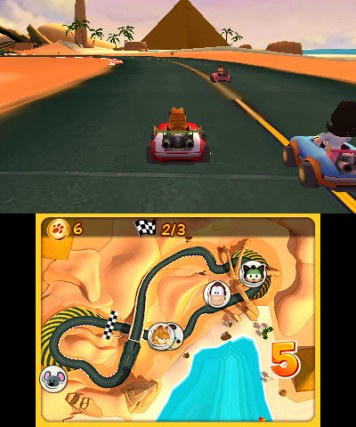 The bottom screen of the 3DS displays an overhead course map and you'll see yourself increasing your distance from the other characters lap by lap. It's lonely (and dull) at the front of the pack with no 2nd place in sight. On the flip side, Garfield Kart suffers from the ancient driving game miracle whereby a 1st position AI character will seemingly be able to zoom off into the distance and be uncatchable. Yet, if you're in 1st, you'll leave the exact same AI for dust. What makes all of this all the more annoying is when you go back to the mobile version and find that (ironically) the touchscreen controls are better, the handling is better and the AI is more fun to play against. In fact, it's actually an ok game and kids will likely love it. To put the final nail in the coffin, these mobile versions are less than a tenth of the price. The only real positives of owning the 3DS version are that the stereoscopic 3D is quite nice and you can still use the tilt controls (if you like that kind of thing). 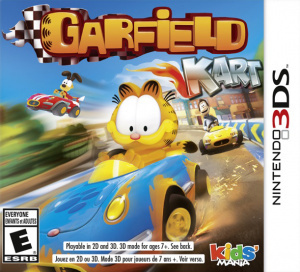 This game is Garfield in likeness only; remove Garfield and you're left with a bland, horribly un-balanced Kart game (that's either way too easy or frustratingly hard) with no multiplayer options. Sounds good? No, of course it doesn't. Looking for a Mario Kart style game for your Nintendo 3DS? Just buy Mario Kart. Pity such great cartoons get lackluster games. Published on a Monday no less. And yet, this would still make sense if it has single races for single-player mode, unlike Mario Kart 7 which oh-so-brightly removed such an option in favor of, well, seven ghosts at once in time trials and, well, grand prix mode. On a friggin' handheld, best fit for short bursts of play! Should pack this up and mail it to Abu Dhabi, am I right? Look up "Garfield Minus Garfield" and, by extension, "Square Root Of Minus Garfield". You won't regret it. This is really why I like this website. Those reviews. haha. Lasagne Cup, bahahaha! That's hilarious. Halfway through a grand prix all of the characters should change to the ones from US Acres. Garfield used to be so amazing a long time ago. There were good comics, Garfield Caught in the Act for the Genesis, and Garfield and Friends on TV. They were all awesome. Now the comics never even come close to being funny, the TV show is a bunch of overused cartoon plots that have been done way better by shows actually worth watching, and the games are just terrible. What happened? Garfield once was a genuinely cool cat (pun intended). He was lazy, snarky, selfish, but he was still nice when it mattered. Nowadays, he's one victim of many horrible reboots that are disgustingly bad in every way, with lazy writing, bland style, and a lot of focus on merchandise. It's sad how readily such cult characters get tarnished for a quick buck. I believe this is a good instance to call the jacks behind all this "philistines". I used to love Garfield comics when I was younger, but he's no longer funny anymore. I gave up being a fan ages ago. OUCH... I can't believe in games like this, or movies like the Smurfs or the squeakquel exist/ make enough money to ruin my childhood memories. I love your title to this article Mr. Town! The only good Garfield game is that DS one. Garfields nightmare, or something. Is there a reason for this game? New movie, comic or cartoon or something? Oh! I completely forgot about Garfield and Friends! Used to love that show! "Sometimes you wish you could just drag somebody out in the street and have them shot, for noo... ( blah blah blah I forget the rest ). Garfield was an great thing back then. It was awesome toon. It also made fun use of the song "Monday" . AKA "I don't like Mondays". An Garfield Racer is more stupider then an "Sponge Bob game". In fact Garfield could be like that game with Ode and him tied together ( like Cartman and Butters ). Even so an new EarthWorm Jim game could be more fun. @RegalSin Man a proper earth worm jim game with roday's 2D animation posibilities get Dan Castellaneta to voice him again I bet it would amazing! You guys should have made the tag line "Send it to Abu Dhabi"
@khululy the biggest issue with making an Earthworm Jim game. 1. The license to make that game first must be purchased. 2. We need an programmer, 3d designer ( if it was going to be 3d ), or 2d artists. 3. Earthworm jim sprites was VIDEOTAPED into the virtual world and not painted via the computer. As with "Far East Of Eden", most of everything was hand drawn to begin with. 4. By Videotaped I mean to say not scanned ( but that could work ) but they used an actual camera to capture the animation. The camera was zoomed down to the resolution with the limited color pallet. This is why the game looks so fluid and is not alone the creation of "Sprite artists". 5. Earthworm Jim 4d should have been released on the GCN years ago. Well, this won't get good profit. man, its like they cant make a good garfield game (except garfields nightmare on DS, that was a good one) why not? @RegalSin really? they used a camera to make that game? cool!